The invention of the Fresnel lens in the early 19th century, and its subsequent installation in lighthouses around the world, was responsible for preventing countless shipwrecks. It's a simple idea. A point source of light can be focused into a parallel beam using a convex lens (Fig. 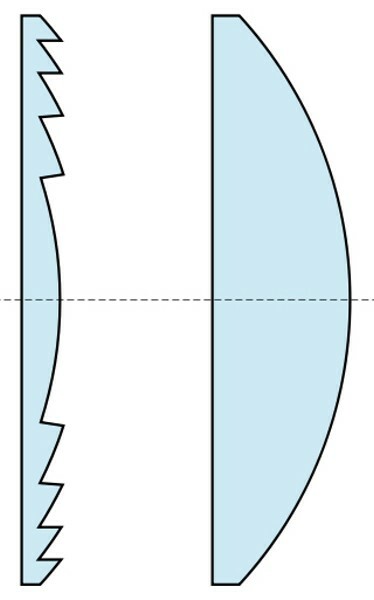 1, right), but an equivalent Fresnel lens (Fig. 1., left) will do the same job with a huge savings in weight and material. Compared to a conventional convex lens, a Fresnel is much thinner and flatter, allowing most of the light from a point source to be captured and focused into a thin beam, so that lighthouses can be seen from far out at sea. Modular construction also results in easier transportation and assembly -- a huge advantage for remote, hard-to-reach locations. The large-aperture, short-focal-length lens system was perfected by French physicist Augustin-Jean Fresnel in the early 19th century, and was first installed in a lighthouse at the mouth of the Gironde estuary on the Bay of Biscay in 1823. Within a few years, a handful of Paris-based glassmaking factories were supplying Fresnel lenses to the world. Today, about 60 Fresnel lenses -- mostly from Paris -- are still in use in lighthouses in the U.S. The lens of Cape Mendocino's lighthouse was manufactured by the Parisian firm of L. Sautter in 1867 and shipped around Cape Horn to San Francisco and on to Humboldt Bay. From here it was sent by wagon to Cape Mendocino, the most westerly point in California. It operated for 80 years, from 1868 to 1948, before being replaced by an electronic beacon. The lens currently graces the entrance to the Humboldt County Fairgrounds in Ferndale in a replica lighthouse, while the original lighthouse structure has been moved to Shelter Cove. 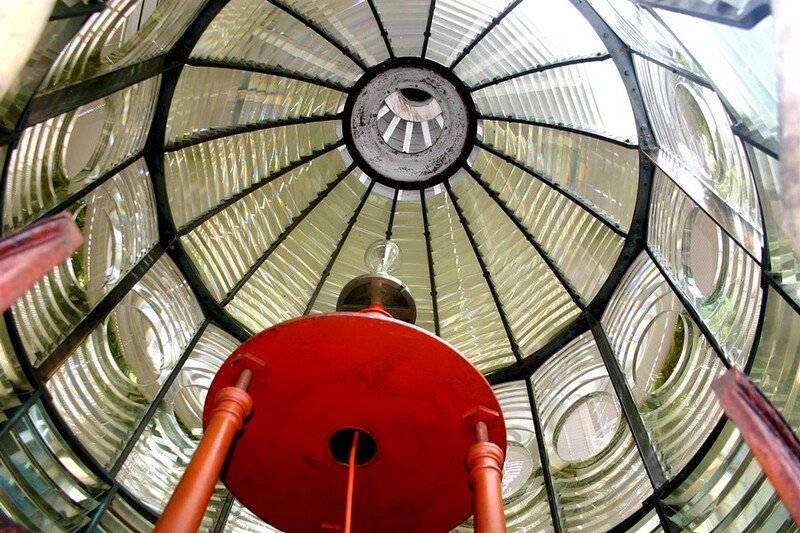 The Cape Mendocino light is a "first order" Fresnel lens, meaning that it's one of the largest ever made, with a focal length (horizontal distance from light to lens) of about three feet. It's about 12 feet high and consists of 16 panels, as shown in the photo. Each panel consists of a central "bull's-eye" glass surrounded by a series of concentric refracting lenses, with the addition of a series of reflecting-refracting prisms above and below. The overall assembly originally contained 672 ground and polished prisms and lenses made of fine French soda-lime "crown" glass. A weight-driven gear train turned the two-ton mechanism once every eight minutes, resulting in a flash every 30 seconds. Fresnel died at age 39 and didn't get to see the extent to which his idea was adopted worldwide. However, his memory lives on in the simple but hugely effective invention bearing his name. Barry Evans (barryevans9@yahoo.com) once had a love affair with a Polaroid SX-70 camera, which used a Fresnel lens. The collection of his first 80 Field Notes columns is available directly from him or from Eureka Books.